An Codú: Spúinse as uisce agus istigh sa phictiúrlann! Beidh an scannán ‘SpongeBob an Scannán, Spúinse as Uisce’ le feiceáil i bpictiúrlanna na tíre ón 27 Márta ar aghaidh. Is ócáid stairiúil í seo do ghasúir Ghaelacha agus éacht déanta ag TG4, Paramount Pictures, Macalla agus chuile duine a raibh baint acu leis. Comhghairdeas leo. Tá socrú speisialta déanta ag Tuismitheoirí na Gaeltachta a thabharfas seans do theaghlaigh leagan 3D den scannán a fheiceáil seachtain roimhe sin ar an Satharn 21 Márta! Beidh léiriú speisialta ar bun i bpictiúrlann an Eye Cinema i nGaillimh ag tosú ar 6.30 tráthnóna, Dé Sathairn 21 Márta. Praghas speisialta de €5 a bheidh ar na ticéid, cuma ar gasúr nó duine fásta tú. An-mhargadh go deo! 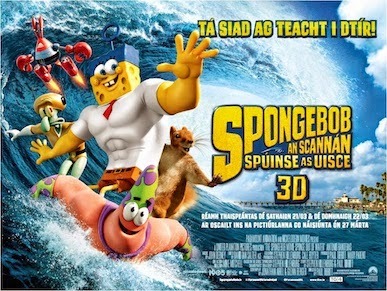 San áireamh i bpraghas na dticéad, beidh teacht le chéile beag mar a mbeidh seans againn seal a chaitheamh in éindí leis an bhfear é féin SpongeBob! Tabharfaidh siad aghaidh ar Scáileán a 6 ina dhiaidh sin, atá curtha in áirithe go speisialta dúinn agus gheobhaidh chuile dhuine deoch agus bosca popcorn. Suífidh muid síos ansin leis an gcéad fhéachaint a thabhairt ar an scannán. Caithfear na ticéid a chur in áirithe roimhré agus moltar do dhaoine é seo a dhéanamh láithreach mar go bhfuil an-éileamh go deo orthu agus gan againn ach líon áirithe suíocháin. 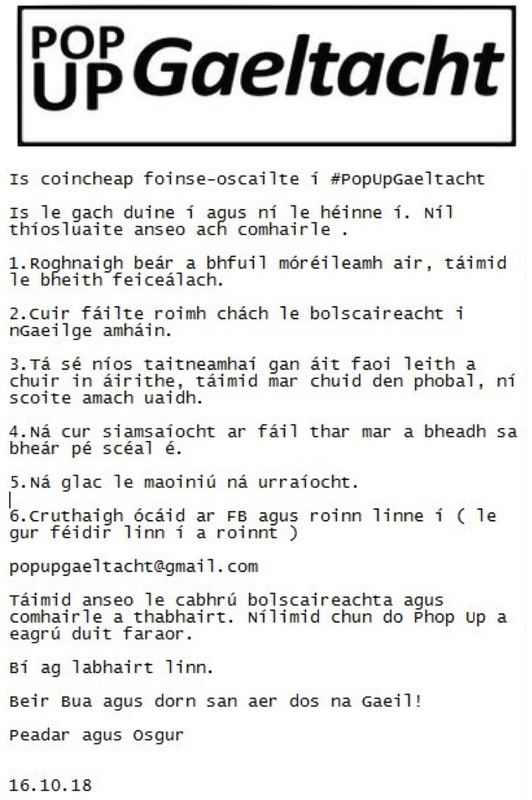 "Beidh polasaí Gaeilge i bhfeidhm mar is gnáth – Gaeilge ar an Scáileán, Gaeilge sna Suíocháin!!!"